After her marriage, Lady Gertrude Leveson-Gower was styled as Duchess of Bedford on 2 April 1737. 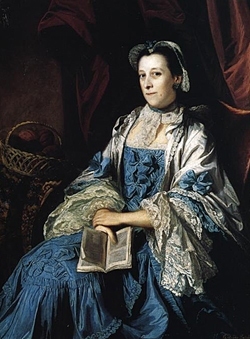 From 2 April 1737, her married name became Russell. [S6] G.E. Cokayne; with Vicary Gibbs, H.A. Doubleday, Geoffrey H. White, Duncan Warrand and Lord Howard de Walden, editors, The Complete Peerage of England, Scotland, Ireland, Great Britain and the United Kingdom, Extant, Extinct or Dormant, new ed., 13 volumes in 14 (1910-1959; reprint in 6 volumes, Gloucester, U.K.: Alan Sutton Publishing, 2000), volume VIII, page 500. Hereinafter cited as The Complete Peerage. [S213] Unknown author, "unknown article title," European Royal History Journal: volume 9.6, pages 23-28. [S6] Cokayne, and others, The Complete Peerage, volume II, page 83. [S6] Cokayne, and others, The Complete Peerage, volume II, page 84. She gained the title of Comtesse de Boulogne. [S11] Alison Weir, Britain's Royal Families: The Complete Genealogy (London, U.K.: The Bodley Head, 1999), page 54. Hereinafter cited as Britain's Royal Families. She was also known as Maud. [S45] Marcellus Donald R. von Redlich, Pedigrees of Some of the Emperor Charlemagne's Descendants, volume I (1941; reprint, Baltimore, Maryland, U.S.A.: Genealogical Publishing Company, 2002), page 56. Hereinafter cited as Pedigrees of Emperor Charlemagne, I.
Matilda de Châtillon was born in 1293. She was the daughter of Guy V de Châtillon, Comte de Saint-Pol and Marie de Bretagne de Dreux.1 She married Charles I de France, Comte de Valois, son of Philippe III, Roi de France and Isabel de Aragón, in June 1308 at Poitiers, France.1 She died on 3 October 1358. [S11] Alison Weir, Britain's Royal Families: The Complete Genealogy (London, U.K.: The Bodley Head, 1999), page 96. Hereinafter cited as Britain's Royal Families. [S6] Cokayne, and others, The Complete Peerage, volume VI, page 138. Lady Alice FitzAlan was born circa 1350 at Arundel Castle, Arundel, Sussex, EnglandG.2 She was the daughter of Richard FitzAlan, 3rd/10th Earl of Arundel and Lady Eleanor Plantagenet.3,4 She married Thomas de Holand, 2nd/5th Earl of Kent, son of Thomas de Holand, 1st Earl of Kent and Joan of Kent, Countess of Kent, circa 10 April 1364.5 She died on 17 March 1416. After her marriage, Lady Alice FitzAlan was styled as Countess of Kent circa 10 April 1364. [S6] G.E. Cokayne; with Vicary Gibbs, H.A. Doubleday, Geoffrey H. White, Duncan Warrand and Lord Howard de Walden, editors, The Complete Peerage of England, Scotland, Ireland, Great Britain and the United Kingdom, Extant, Extinct or Dormant, new ed., 13 volumes in 14 (1910-1959; reprint in 6 volumes, Gloucester, U.K.: Alan Sutton Publishing, 2000), Volume 12, page 899. Hereinafter cited as The Complete Peerage. [S6] Cokayne, and others, The Complete Peerage, volume XII/2, page 899. [S11] Alison Weir, Britain's Royal Families, page 78. [S6] Cokayne, and others, The Complete Peerage, volume XII/2, page 548. [S11] Alison Weir, Britain's Royal Families, page 102. [S6] Cokayne, and others, The Complete Peerage, volume I, page 242. [S6] Cokayne, and others, The Complete Peerage, volume II, page 60. [S6] Cokayne, and others, The Complete Peerage, volume I, page 243, says 1330-1331. [S11] Alison Weir, Britain's Royal Families, page 79.